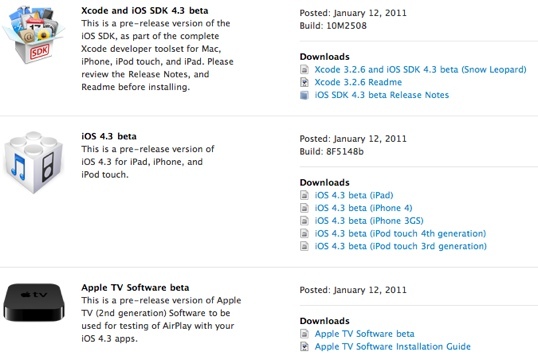 Apple 於今日開放下載 iOS 4.3 Beta 開發者版本, 分別適用於 iPad, iPhone, iPod touch 及 Apple TV 2G. 此版本 (iOS 4.3 Beta) 只適用開發人員, 如沒有參與 iPhone Developer 計劃 (即開發人員), 請不要嘗試下載或升級至 iOS 4.3 Beta! 若果你是 iPhone Developer 計劃的開發人員 (Standard/ Enterprise Program) , 可按此前往下載 iOS 4.3 Beta for iPad, iPhone, iPod touch 的 iOS 或 SDK.